Home › Uncategorized › Can the Energy Industry Be Trusted? Can the Energy Industry Be Trusted? 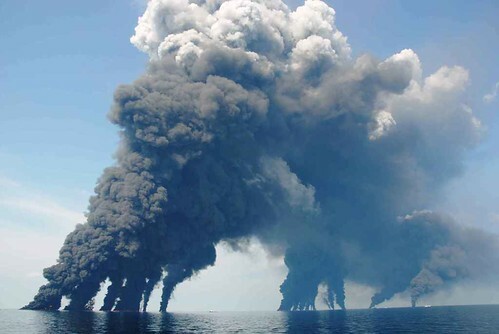 Deepwater Horizon Oil Spill – FSU Sampling Cruise – June 22, 2010, a photo by SkyTruth on Flickr. Hmm, let me think about this for a nanosecond – NO! This is the question Time magazine posed this week in their “Environment Special” issue. Then in tiny type “but drilling for it threatens our land.” Ask Josh Fox the director of Gasland. He lived in a part of Pennsylvania where hydraulic fracturing (or fracking) was occurring and an energy company wanted to pay him to use his land. He started searching for information about fracking and found families who could light their tap water with a match and had numerous health issues. Let’s see are there other reasons not to trust energy companies? In a recent regulatory filing, the company lauded its “exemplary” safety record, calling 2010 “the best year in safety performance in our company’s history,” despite the “tragic loss of life” that occurred in the platform explosion. After an uproar, they decided to donate the bonuses to a fund for the workers killed in the disaster. It now appears that the NRC, TEPco and the nuclear industry are downplaying the effects of the meltdown in Japan and keeping a lid on more information getting out to the public. If you want to keep tabs on what is going on, the best source is a gentleman named Arnie Gunderson who lives here in VT. He worked for the nuclear industry for years, but left when he could no longer watch cost cutting and deception that he felt was leading to dangerous situations at the plants where he worked. He has consistently been correct about the issues at VT Yankee – our 40 year old nuclear plant with the same design as the Fukushima plants – that the plant owner and state government dismissed until Arnie was proved correct. I could go on for days, but I won’t. The bottom line is that we, as a society, need to change how we do things. Little things and large things. Until we cut down on the amount of energy we need, we will have oil spills and nuclear meltdowns and health issues from the extracting of coal, gas and oil. We need to make changes to how we live, work, buy, eat and more.